The Tec Lighting XtraCoat Offline UV Coating system offers the ideal combination of performance and affordability. The XtraCoat lineup was designed with your needs and desires as a main priority. The XtraCoat Offline UV Coater will give you the ability to Gloss and Satin coat almost any printed sheet with ease. The system is offered in many configurations to fit your requirements, sizes range from 18” to 30” with a modular design to allow for added components such as an automatic feeder for increased production in the future. Let us show you the increase in capabilities and profit that you can achieve with the addition of the Tec Lighting XtraCoat Offline UV Coating system. Double sheet detector with deflector plate to ensure smooth and consistent feeding. Three roll coating application system with stainless steel doctor blade. Each roller is independently controlled with a worm gear to ensure even pressure across the roller. Precision Stainless steel doctor blade system keeps bottom impression roller clean from any coating transferred by the applicator roller. The system incorporates both IR and UV lamps in the curing process. The 3 lamp IR section will help flow out UV coating and dry water based coatings when running the aqueous process. The design of the UV lamp reflector guarantees maximum light output at lower operating voltages. 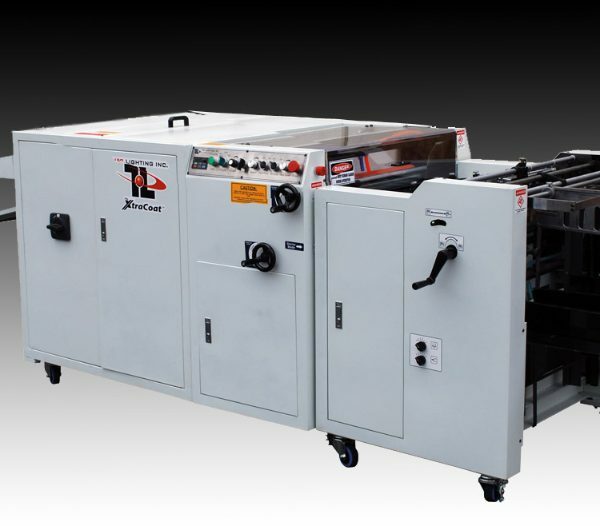 The compact design of the XtraCoat UV Coaters offers a remarkably smaller footprint than a comparable UV Coater with all the features of the XtraCoat UV Coater. The unit fits seamlessly into print shops of any size. The simple design also eliminates the need for highly trained personnel to operate the system. All operator training is done by Tec Lighting technicians at your pace, at your location. Within 5 minutes of turning on power to the system you will begin to UV coat your prints with quality UV Coating. The results are immediate; you will notice a remarkably enhanced sheet with a stunning finish and image protection ready for anything you can throw at it. Environmentally friendly: UV Coating with the XtraCoat UV Coater may just be the most environmentally friendly way to apply a finish to your printing. The TEC COAT™ line of UV coatings are 99.9% VOC free and meet or exceed all environmental air quality regulations.